First Year Experience is an orientation program that places an emphasis on a student’s first year on campus. Our goal is to help students build meaningful relationships while acquainting them with campus life. FYE consists of two parts, Welcome Week and Faulkner Foundations. Welcome week is a 4 day orientation experience for incoming freshmen and transfer students. It is designed to help students transition to Faulkner University through student-mentor led activities and events. Some welcome week activities include cookouts, service projects, devotionals, and Rocking Jump (indoor trampoline facility). 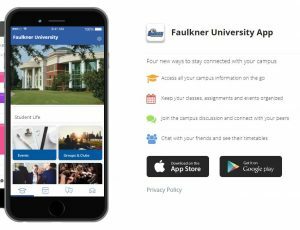 As a new student you will want to download the Faulkner Mobile App. The Faulkner Mobile App is used for scanning into Chapel and tracking Chapel Attendance as well as communicating with fellow students, staff and faculty. If you have set up your assigned Faulkner email address you can download it now. You will need to use the login and password that you use to access your Faulkner email. Click on link below from your mobile device and get started. If you have questions or need help please email studentlife@faulkner.edu. Faulkner Foundations is a course which meets once a week for 9 weeks. This course is designed to helps students transition academically to college life at Faulkner University. Students will cover a variety of relevant topics with a faculty instructor. Topics will include community service, support services and academic skill development.